Some of the most unique wedding and reception venues are locations with history and character that have been repurposed for use as an event space. An old barn or firehouse can be renovated and turned into a wedding venue that recalls the history while looking forward to the future. Such is the case of the former home of Consumer’s Bakery, which again breathes life, this time as the 4 Sisters Wine Bar. When eponymous sisters bought the building they had an entirely different idea in mind. Their initial vision was to have a catering kitchen, and perhaps a small area in front for bridal consultations, but a few turns of fate later and they had turned this historical building into a wine bar full of character. 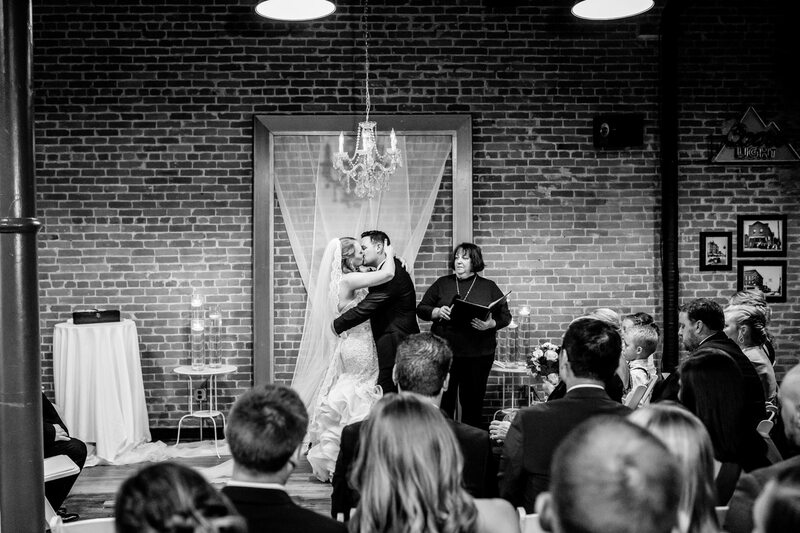 With a cozy interior and decor perfect for any wine enthusiast, 4 Sisters Wine Bar wedding venue is perfect for a smaller wedding reception or rehearsal party. Located just blocks from the Mississippi River, it offers plenty of picturesque backdrops for your wedding or reception photo shoot. With a full-service catering company, 4 Sisters Wine Bar will make sure your guests are well-fed, and with a unique self-serve wine dispenser, your guests will be able to sample a wide selection of wines, even if they can’t pronounce the names. One advantage to booking your wedding or reception at 4 Sisters Wine bar is that their in-house catering company can handle all the details, from crafting a custom menu just for your event, to decorating and arranging your flowers, to decorating the room. This saves you the hassle of having to juggle multiple vendors when you should be focusing on your big day. Even if you’re not sure how to craft a menu or pair wines, you can simply describe the event, the mood, and show them a bit of your personality, and they’ll figure out the perfect culinary spread to make your event one to remember.